Dallas Cowboys star Ezekiel Elliott will be suspended for six games for violating the NFL's personal conduct policy, league officials announced Friday. The NFL said its decision to bar Elliott from the field when the regular season begins comes after an "extensive investigation" into a domestic violence complaint first lodged against him last year. The 22-year-old running back will not be paid during his suspension. The NFL said Elliott has three days to appeal the suspension, which is slated to start Sept. 2. A hearing would be held with NFL Commissioner Roger Goodell or another league official. Elliott did not immediately comment on the suspension. The NFL Players Association said in a statement it is "reviewing the decision and have been in touch with Ezekiel and his representatives to consider all options." If the suspension goes into effect, Elliott can still participate in preseason practices and games, and return to the team's active roster as soon as Oct. 23. He would miss games against the New York Giants, Denver Broncos, Arizona Cardinals, Los Angeles Rams, Green Bay Packers and San Francisco 49ers. 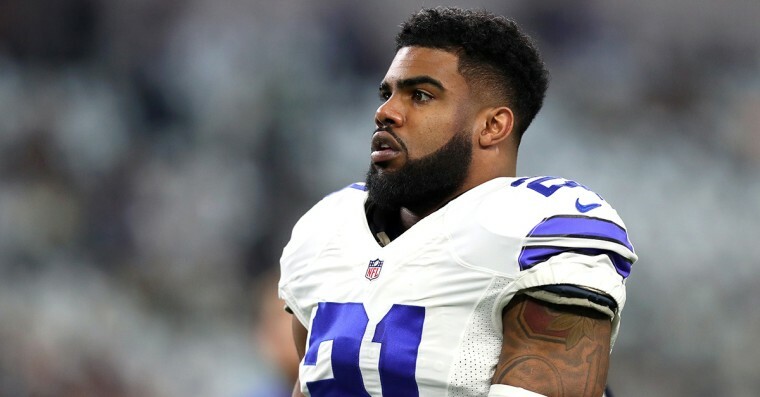 The investigation into Elliott began after a woman in February 2016 said that she suffered an injury after the football player pushed her against a wall during an argument in Florida, according to a police report first obtained by USA TODAY. He was not arrested and she declined to go to the hospital, the report said. Five months later, the woman said Elliott also had assaulted her in Ohio, and abused her over several days, The Dallas Morning News reported last year. She told police in a report that she was his girlfriend, but he denied being in a relationship with the woman. Prosecutors decided not to press charges. Elliott complained earlier this year that NFL investigators appeared to be dragging their feet. The NFL said Friday that more than a dozen witnesses were interviewed, including the woman who alleged physical violence. "The league also consulted with medical experts. League investigators examined all available evidence, including photographic and digital evidence, thousands of text messages and other records of electronic communications," the NFL said. In light of Elliott's suspension, he is set to forfeit about $559,000 in 2017 salary and a possible $1.44 million in signing bonus repayment, tweeted Spotrac, a player valuation database. Elliott was also the subject of backlash in March after video posted online purportedly showed him pulling down a woman's top and exposing one of her breasts at a St. Patrick's Day parade. Domestic violence awareness groups condemned the conduct and the NFL's lack of public comment at the time — in light of its past promise to act forcefully in cases of sexual or physical abuse.